I grew up south of the city of Ottawa, in a small rural village named Manotick. We didn’t live in the village we lived south of the village between Manotick and Kars. The roads that diviied up our community, essentially a farming community were labelled lines in lieu of names and could meander from one village to the next. Getting to highschool was a bit of an ordeal because our highschool, South Carleton was in Richmond and by schoolbus it took the better part of 45 minutes to an hour as it travelled up and down the lines of our community. As young adults before we could drive and had cars, we had the opportunity to get to know other teens really well because we spent the better part of two hours a day travelling together. As an aside, having a car at 16 to get around was almost essential. Anyhow, there was this one girl who chose to eat her breakfast on the bus rather than at home. We were acquaintances rather than friends but it was through her that I developed a passion for all things onion. Most mornings she would eat a bagel with cream cheese and scallions. I asked her about it once and she graciously offered a piece for me to try, I declined. Thoughts of onion breath at highschool in combination with being introverted was just too big a risk to take. I remember thinking this was an odd combination especially for breakfast but the aroma of the combo was intoxicating. Toasty bagel, creamy cheese, salty butter and pungent onions. At home I gave the combo a try and my tastebuds fell hard. That girl, I wish I could remember her name, even at the awkward age of teen, where we were all just trying to fit in and weirded out by just about everything, was a foodie. She had a good thing, she didn’t care what anyone thought and I admired her. The New York Deli Rye took me back to that moment where the aroma of fried onions and baked bread first permeated my olfactory lobe. 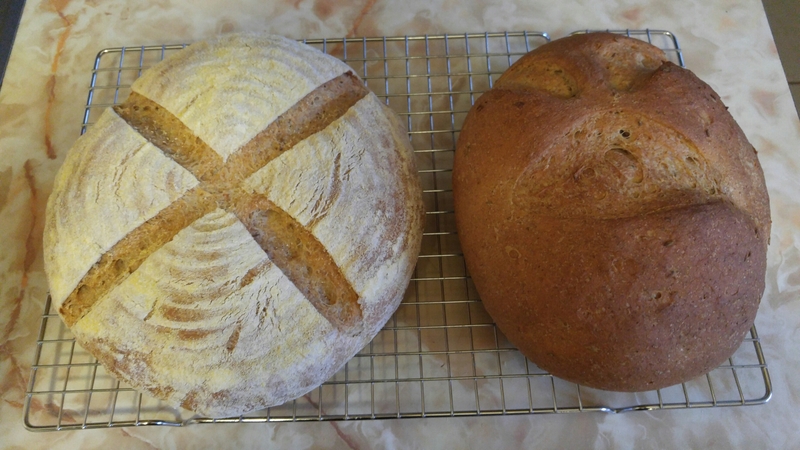 While the bread was baking I was excitedly impatient for the baking and cooling processes to be done. The house smelled amazing. This bread was just too addictive for me to stay away from. Even on day two the light aroma of onions would waft up and dreamily I would think, then chastize myself, You can’t eat this, you have Hashimoto’s, you will pay. Chastened, but searching for the bread knife all at the same time my head tried one last time You are not going to eat this. My heart took the lead, it was singing, maybe just one small bite. While the days of indescriminate amounts of salted butter, full fat cream cheese are long behind me I finished the small slice. Le sigh. 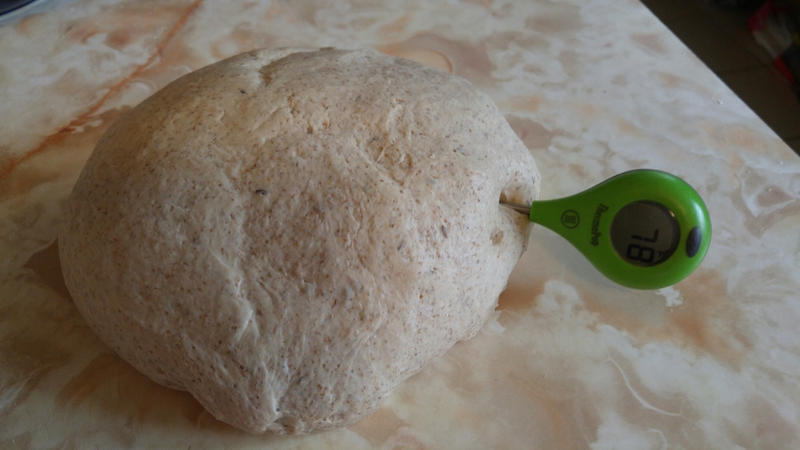 This bread takes two days to make. 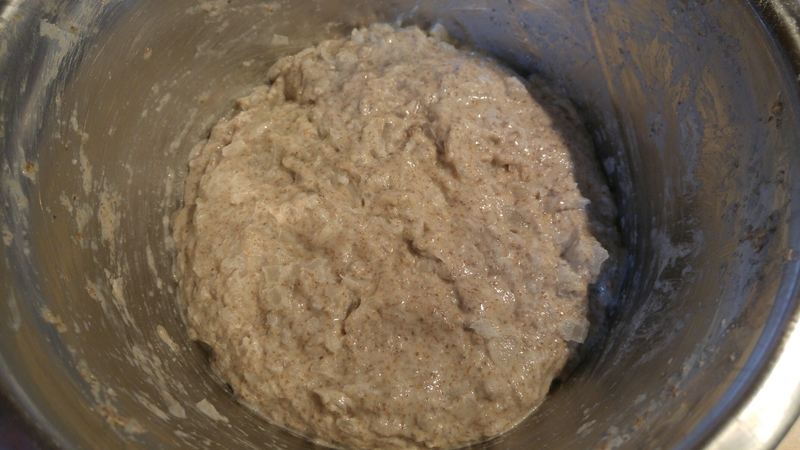 For my kitchen the rye sour starter needed 5 hours at room temp until it bubbled and foamed. It rested overnight in the fridge. 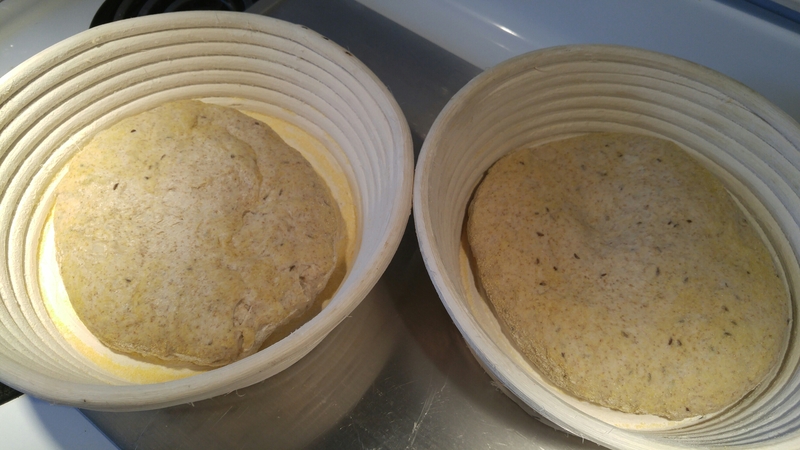 Day 2 we chose to crust our loaves with polenta grind cornmeal. 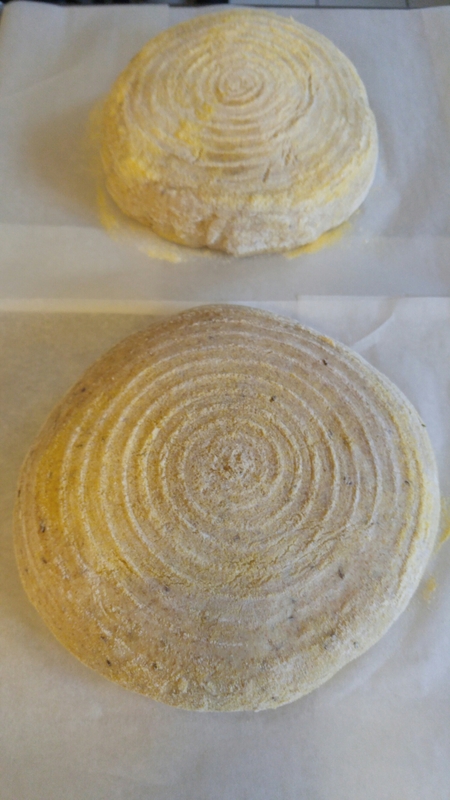 With the bannetons seasoned I dusted them with cornmeal. I almost gave up on this dought. 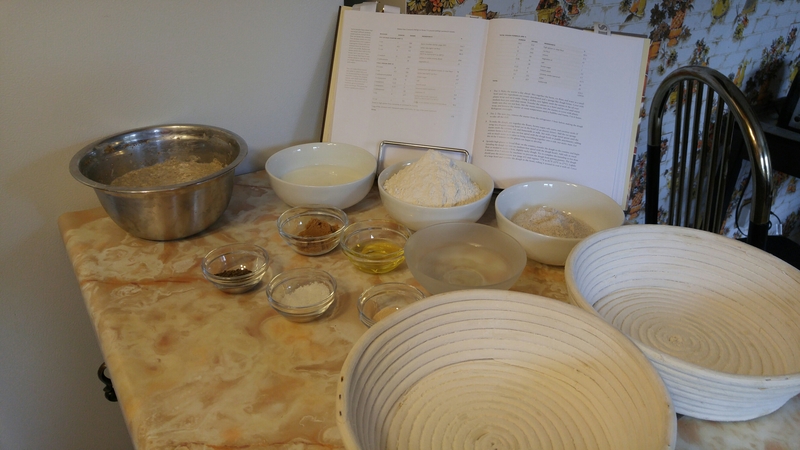 When I make it again I will mix the dough with buttermilk first to see where we are at before adding any water. 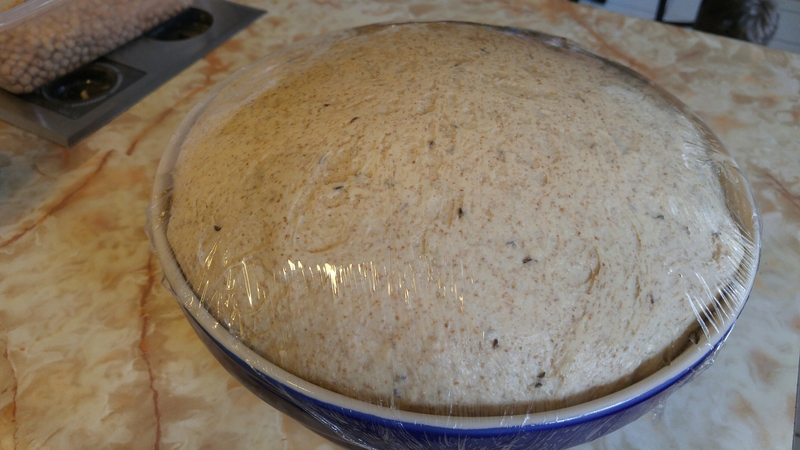 The dough was incredibly sticky and tough to get to the right consistency. Prooved and beautiful. I had a complete nerd moment when they released from the cane baskets. So, cool!!! 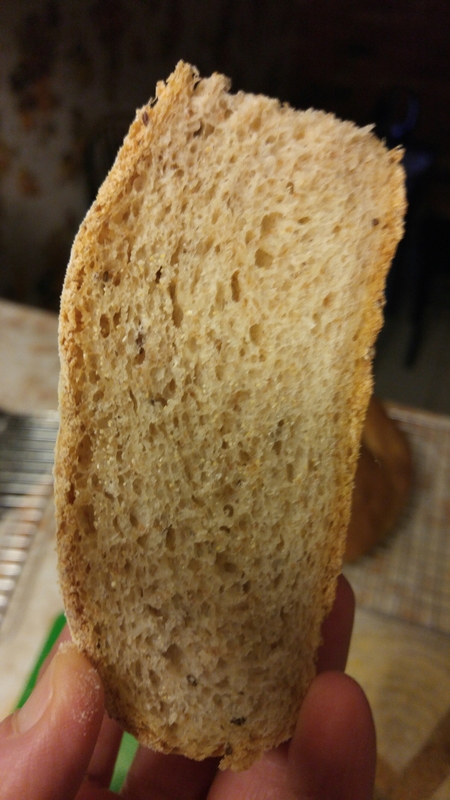 For me this bread was exciting and scored full marks on all criteria. Chris agreed. It was fab on its own but a better bread can’t be found for deli meat sandwiches. I will make this again soon with a view to making reubens.